Wabash speech and pre-law students didn’t get the live Appeals Court hearing they were expecting Feb. 22, but instead may have gotten something better. The Indiana Court of Appeals had scheduled a live hearing on a murder case. The hearing was canceled when lawyers didn’t get notice the hearing was not going to be in Indianapolis. Instead of the hearing, students had the opportunity to question the three appellate court judges for nearly an hour. "This is part of what we believe to be our education mission," the Honorable Margret G. Robb said. "We think part of the reason people respect courts and their decisions are when they have some knowledge of them. And particularly with young people, it’s important to let them know we’re real live human beings; we have family; we have kids; and we don’t know all the answers." Robb was joined by the Honorable James S. Kirsch and Honorable Patricia A. Riley in the Goodrich Room at Lilly Library for the discussion. "Coming here is always a special thing for us," Kirsch said. 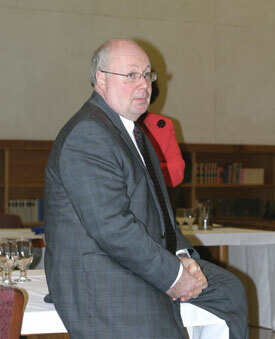 He also admitted a bit of prejudice since his son, Adam ’06, is a Wabash student. "This is always one of our best audiences." The gathering included David Moscowitz’s legal debate speech class, other students, professors and 5-6 lawyers from the Crawfordsville community. 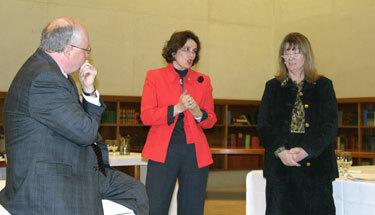 The judges answered questions about the appeals court and talked about the appeals process. "In the vast majority of cases we don’t rule or not whether we would have ruled that way, but did the trial court judge have the right to make the decision he did," Kirsch explained. Many of Moscowitz’s students are pre-law students. "They’re already so invested in the process so they’re drawn to the class already," Moscowitz said. "But they want to know real world results. When we do simplified or mock cases in class it’s not entirely satisfying when they ask me what happened with this when it’s based on a real case, but it’s not an exact case. "Really bringing this process on to campus, into their environment, into their context is really a powerful process of identification that they can engage in." Andrew Weintraut ’06 is a member of Moscowitz’s class and is considering law school. "It was a great opportunity to hear these people talk," he said. "They’re high-ranking judges in the state of Indiana and just being able to hear firsthand what they’re doing is quite an experience." Top right: Robb makes a point while Riley, at right, and Kirsch listen. Lower left: Kirsch listens to a student's question.